ABIT, the Taiwanese mainboard manufacturer, has released quite a few high performing boards over the last 2 years. 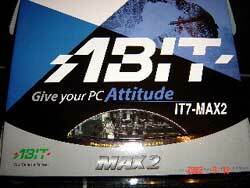 ABIT’s first DDR mainboard, the KG7, was and still is praised as one of the best performing AMD 760 chipset based boards. 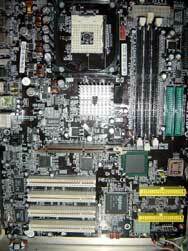 The legendary KR7 for VIA’s KT266A and the KX7 for the KT333 chipset followed suit. In the Intel domain the various versions of the TH7 for RDRAM and recently the BD7 and IT7 for DDR memory made headlines as best performing P4 platforms. 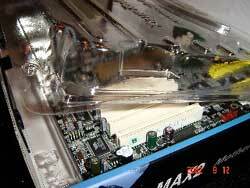 More than that, ABIT developed a new mainboard concept in form of the “MAX” product line. The “MAX” boards come with a maximum of onboard equipment and are “legacy free”. USB ports replace the PS/2 and the I/O parallel/serial ports. After testing the KR7 and BD7 with excellent results, we have here a closer look at the IT7 Max 2 - the new ABIT flagship board for the Pentium 4. This is the second incarnation of the IT7, which was in high regard for features, performance and overclocking potential. We will focus this article on the performance and in particular the overclocking capability of the IT7 Max 2. Before that, let’s have a short look at the board and its features to see whether the “MAX” moniker makes good on its name. ABIT has gone an extra mile to protect the IT7 Max 2 Max from transportation damage - it comes in an additional plastic housing, different to the cheaper ABIT boards. This hard cover prevents damage to the precious board much better than the usual cardboard box. This detail is not unimportant because of the IT7’s standing battery. Unfortunately our previously tested BD7-II that also has the standing battery and is shipped in the regular cardboard box arrived with a broken-off battery. The layout of the IT7 Max 2 is without flaw: the space around the socket is sufficient to accommodate even the biggest sinks, the ATX and the additional 4-power-connector are located at the best possible places, the DIMM sockets are not hindering the installation of the video card, the IDE, RAID and floppy connectors are all well within reach. The original IT7 was lacking PS/2 ports for mouse and keyboard. Obviously users complained because not everybody was prepared to buy a USB mouse and keyboard. The good news is: PS/2 ports are back with the IT7 Max 2. The IT7 Max 2 has 4 PCI slots. The lack of a 5th and 6th slot is not too big an issue because LAN, sound and RAID are already on-board. The absent PCI slot directly below the AGP slot is not usable on most boards anyway, due to the AGP card cooling requirements. The only feature we missed (looking at our brand-new Radeon 9700) is AGP8X. But, there is something more to report that is difficult to express by facts and figures: the finish quality of a product. Those who are frequently changing such devices get after a while a good feeling for what is well made above average and for what is shabby. As far as the IT7 Max 2 is concerned: the board looks perfect, we did not find any sign of lackluster production such as bend or half-fixed connectors, shoddy soldering, blurred silk print. Our conclusion so far: By features and appearance the IT7 Max 2 is complete and well made; it looks very much like a flagship. The advantages of the thinner SATA cable and the much smaller connectors are obvious, the advantage of the higher interface speed has to be seen. Current HDD are not even exploiting the 100 MB/sec maximum bandwidth ATA 100 is offering. The first SATA HDD are due any time soon and it is therefore important to have SATA capability. The implementation of serial ATA support on the IT7 Max 2 deserves special attention. The IT7 Max 2 comes with the 4-channel Highpoint HPT 374 on-board RAID controller. We have tested this controller already some time ago and found it superior to the competing Promise TX/4 4-controller. ABIT engineering in a very clever way took advantage of the fact that this controller is providing 4-channels. They switched 2 channels form parallel to serial with the effect that the IT7 became a hybrid board providing both at the same time: parallel and serial RAID support. This is an unique “market-first” feature and a considerable cost saving. The stand-alone serial 2-channel adapter from Highpoint is around 90 USD, which is already half of the retail price of the IT7 Max 2. But even better: The IT7 MAX2 comes complete with the ABIT “Seriallel” converter cable that enables users to connect parallel ATA HDDs to the IT7 Max 2 serial ATA ports. Users have the option of using parallel or serial drives without wasting system resources on serial ATA ports that may not be used, because with the “Seriallel” adaptor the user can hook up the 4 channel RAID with both, parallel OR serial HDD.